A meeting requested by slain rapper Nipsey Hussle with Jay-Z's Roc Nation entertainment company and officials from the Los Angeles Police Department on combating gang violence will still take place. Los Angeles Police Commissioner Steve Soboroff told NBC News on Monday that representatives from Roc Nation requested that the meeting proceed out of respect for Hussle, who was an advocate for his native South Los Angeles. The meeting was to occur Monday but the date now is undetermined. The Grammy-nominated rapper, born Ermias Asghedom, was fatally shot outside his clothing store in Los Angeles' Hyde Park neighborhood on Sunday afternoon. He was 33. Hussle was shot multiple times in the parking lot of The Marathon Clothing, a store he opened in 2017. He was pronounced dead at a hospital, police sources said. The shooting left two others wounded, according to police. Police have not yet named a suspect or a motive for the shooting. Soboroff tweeted Sunday that he and Police Chief Michel Moore were to meet with Hussle on Monday afternoon to "talk about ways he could help stop gang violence and help us help kids." "Many of us will join together to stop what ever caused your, and so many other tragic unnecessary killings," Soboroff said in a tweet Sunday. Hussle first gained acclaim in hip-hop for his three-part mixtape series, “Bullets Ain’t Got No Name.” His debut album, “Victory Lap,” was nominated this year for best rap album at the Grammy Awards. Hussle had been associated with a street gang, the Rollin 60s Neighborhood Crips, which he had attributed to his circumstances. Hussle was also an entrepreneur and philanthropist. 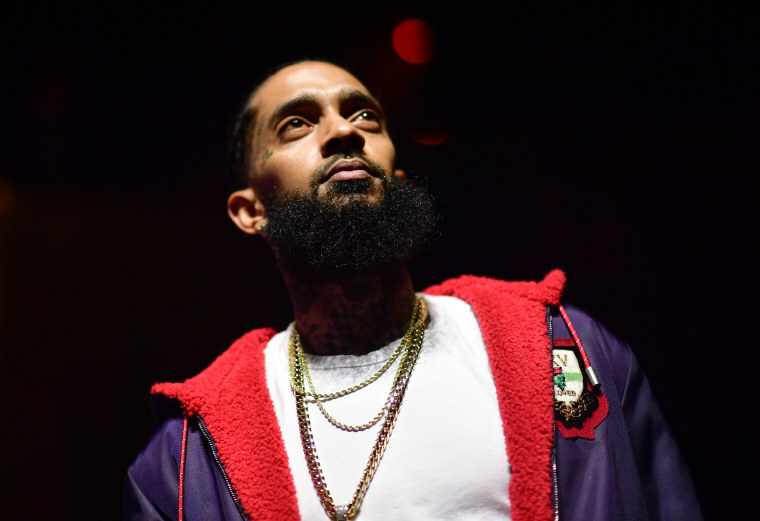 "Nipsey was not only one of the greatest artists we worked with but an amazing father and leader in his community," his record label, Atlantic Records, said in a statement Sunday. "One of the kindest and brightest stars in the universe, he was inspiring to all. We will miss him, his music and everything he stood for." Hussle invested in Vector 90, a co-working space in South Central Los Angeles, where young people can take classes in science, technology and mathematics. He described the center as a "bridge between Silicon Valley and the inner city." At last year's Afrotech conference, Hussle said that he hoped to expand the program to other cities, such as Atlanta, Washington and Baltimore. He is survived by his longtime girlfriend, actress and model Lauren London, with whom he had a son, Kross, and by a daughter, Emani, from a previous relationship.